A train carrying millions of pounds of crude oil derailed Monday in West Virginia, burning through the night, marking the latest major rail accident involving hazardous crude. Since July 2013, 11 major oil-train derailments have occurred in North America. The derailment in Fayette County led to the evacuation of the towns of Adena Village and Boomer Bottom, according to reports. 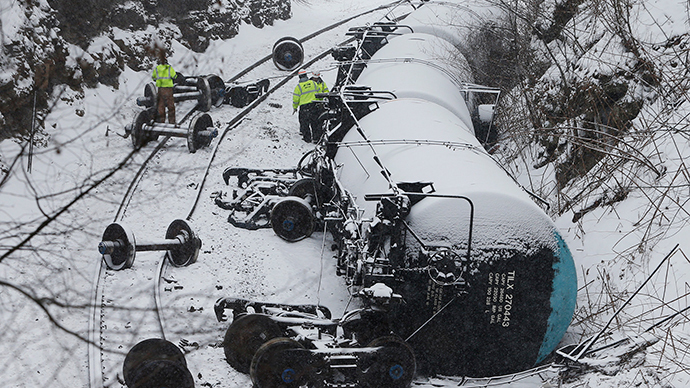 The CSX train consisted of 109 tanker cars and two locomotives, with as many as 25 cars jumping off the tracks amid a snowstorm, according to the Charleston Gazette. At least 14 cars ignited, said Jennifer Sayre, the Kanawha County manager. One car ended up in a tributary at its confluence with the Kanawha River, while another car rammed into a house, bursting into flames, according to Lawrence Messina, communications director for the West Virginia Department of Military Affairs and Public Safety. One person was treated for an inhalation-related injury, CSX reported. Gov. Tomblin declared a State of Emergency for Kanawha and Fayette counties on Monday evening. About 800 homes in Fayette County were without power Monday evening, and water was turned off in some communities given oil had leaked into water supply, according to the state Department of Health and Human Resources. A water treatment plant in Montgomery was shut down, affecting as many as 6,000 people, according to West Virginia American Water spokeswoman Laura Jordan. Initial reports said oil and other contaminants had reached the Kanawha River, the source of drinking water for many state residents. Jordan later said emergency responders believed the oil was contained in the river’s tributary, Armstrong Creek. “If there is clear confirmation from responders that crude oil and other potential contaminants resulting from the accident did not reach the Kanawha River, the West Virginia Bureau for Public Health has given us permission to restart the Montgomery plant,” West Virginia American Water said in a statement. One year ago, multiple spills consisting of thousands of gallons of coal-cleaning chemicals leaked into West Virginia’s Elk River, another tributary of the Kanawha River, leaving hundreds of thousands of people without running water for weeks. The spill underscores the risks that come with the current oil and gas boom in North America. Within the last two years, there have been at least 11 major derailments in the US and Canada that involved trains carrying immense amounts of oil, according to a December 2014 report by the US Congressional Research Service. An ethanol train derailment in northeastern Iowa last week again highlighted the need for increased safety measures, legislators said. States near the energy boom are concerned as more and more oil and other materials coming from North Dakota and Canada. The Minnesota Public Safety Department recently released a report that said the state’s first responders don’t feel like they have adequate training to deal with derailments that spill hazardous materials.